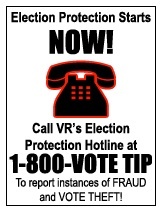 Velvet Revolution dot US (now renamed Protect Our Elections/EMPR Inc) was Brett Kimberlin’s vehicle for promoting his “election integrity” campaigning. The TKPOTD from five years ago today took a look at one of his efforts. Brett Kimberlin achieved his third wave of fame by being publicly upset about election integrity. Episode 1 was the Speedway Bombings, and episode 2 was the story about selling dope to Dan Quayle. Episode 4 has been his anti-First-Amendment lawfare. I called the number yesterday and got a recorded message from the 800 number reseller who owns the line offering it for lease. Velvet Revolution hasn’t been using it for a while. I wonder why their are still promoting an tip line that doesn’t exist? Kimberlin has finally realized that there’s an election coming up, and he’s got a new post up at the revamped Protect Our Elections site titled Russia’s Plan to Interfere with the 2018 Election. (No, I won’t link to it.) The post claims that the Russians are going to engage in online hacking to try to throw the Florida governor’s race to the Republican candidate in order to prevent a criminal investigation of President Trump’s real estate holdings in that state. It claims that the Russians will also work online to help defeat a long list of Democrat senators who are up for reelection while supporting a list of Republicans seeking reelection to the House of Representatives. This work is supposedly being coordinated with an Israeli firm. Oh, and the Russian plan involves disinformation pushed out via Fox News and Breitbart and such alt-right outlets as Wikileaks. And it has a Donate button. One more thing … If the Gentle Reader does visit the Protect Our Elections site, due caution should be observed. This entry was posted in Election 2018, Team Kimberlin, Trolls and tagged Brett Kimberlin, Protect Our Elections, Russian Collusion by wjjhoge. Bookmark the permalink. If a website crashed in a server, would it make a sound?